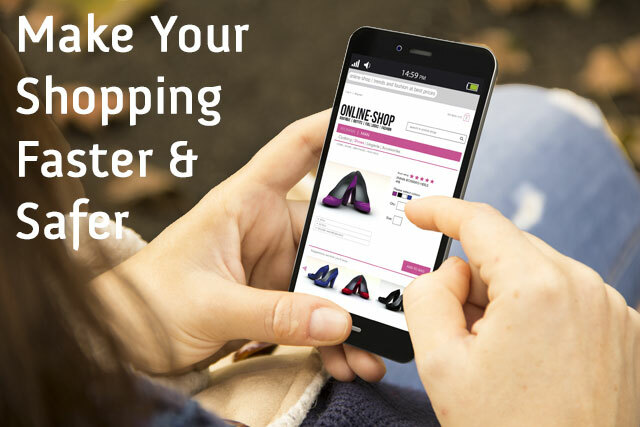 We’re using our smartphones and tablets to shop online more than ever. Some 70 percent of retail giant Amazon's holiday 2015 orders were placed from a mobile device, and the numbers are likely to be even higher this year. Amazon makes it simple; the site's 1-Click ordering lets you order anything with the press of a single button, once you’ve set up your default billing and shipping information. Mobile shopping isn’t quite that easy with every online retailer. Most of the time, shopping from your smartphone means filling out address and credit card details on a frustratingly tiny keyboard. But that doesn’t mean you’re consigned to firing up your desktop computer. You have options. Third-party payment services let you shop at your favorite online stores without entering a single credit card number. Provide your credit card information to the payment service once, then log on to the service whenever and wherever you want to pay. Third-party payment services aren’t only a simpler way to pay; they’re a safer way to pay. These payment services add an extra layer of security to your shopping, most of them including their own protections against fraud and questionable retail practices. On top of that, retailers never get your financial information, so there's less of a chance it could be compromised or stolen. But no matter how convenient these services can be, there's a downside. Not all stores support all payment services. You’ll need to pick the one that supports your favorite stores. So how do you get started? We'll walk you through how to use the five biggest online payment services. Amazon has its own system for handling payments on other sites. The major advantage of Amazon Payments is that if you're already an Amazon customer, you're already set up for Amazon Payments. It uses your default Amazon payment method and shipping address. If a site supports the service, you'll see an Amazon Payments button at checkout. Just click, log on to your Amazon account, and confirm your purchase. The service will also help you with returns and refunds, letting you contact merchants through Amazon Payments and stepping in to investigate the matter if you don’t get a response. The downside to Amazon Payments is the limited number of merchants using it. Current retailers accepting Amazon Payments include Woot, Adafruit, Gogo, CityPass, Bluefly and TigerDirect. But since you likely already have an Amazon account and don’t need to set up anything else to use it, Amazon Payments is a convenient option when you're shopping at a store that supports it. You probably already use PayPal to send money and make payments online. PayPal One Touch makes checkout even easier. When you enable One Touch on your PayPal account and set up your mobile devices, you can check out almost anywhere that accepts PayPal without even logging on. To use One Touch, simply log on once every six months and then check out with a single click. PayPal verifies your identity by requiring you to use the same device and browser for transactions. It's definitely the simplest service to use on this list, coming the closest to Amazon's 1-Click shopping experience. Just like PayPal, One Touch is securely backed by purchase protection. The company will monitor your account for fraud and help resolve disputes if there’s a problem with an item you received. If a retailer doesn’t send what you ordered — for example, you receive a used item that was described as new — PayPal will make sure you get a refund. If your mobile device is lost or stolen, simply log on to the PayPal website to disable One Touch. PayPal is supported by millions of merchants, including half of the top online retailers, making it a streamlined way to pay no matter where you're shopping. As mobile payments become more popular, the big credit card companies are getting in on the game. With MasterPass, you set up your shipping address, loyalty cards and payment information, whether that's MasterCard or not, and then click the MasterPass option at checkout. It's not quite a seamless solution because MasterPass lets you select your card and shipping address for each transaction, but it's easier than entering your payment information on each site, and it allows you extra flexibility. MasterPass is as secure as your MasterCard. If you'd like extra peace of mind, it can send you text messages whenever you've made a purchase so you’ll know immediately if there's a problem. You can use MasterPass at thousands of merchants including Neiman Marcus, Blue Nile, Broadway.com, NewEgg and TigerDirect. While other payment services on this list boast about the number of merchants you can use their payment system to shop with, Visa Checkout has a more modest list of supported stores—but they're places you probably want to shop. On the list are retail giants like Walmart and Best Buy as well as other popular shops like Starbucks — where you can place orders through the app using Visa Checkout — plus United Airlines, Gap, Staples and more. Like the rest of these services, setup is straightforward. Sign up, add your credit cards and shipping information, and then when you're shopping on a supported website, log on with your Visa Checkout account to pay. Visa Checkout is backed by Visa, making it just as secure as your credit card. While Android Pay is primarily designed for making payments in retail stores — tap your Android phone on a reader to pay rather than getting out your credit card to swipe — Android Pay is also a convenient way to make purchases inside Android apps. With Android Pay, you can buy a ride with Lyft, pick up tickets through Ticketmaster, or order dinner through Eat24. More apps are being added all the time; Airbnb, Grubhub, Newegg, Etsy and Uber are coming soon. To get started, add your credit card information to the Android Pay app, which comes preloaded on many phones. When you're shopping in a supported app, click the Android Pay option and log on to check out. Whenever you make a purchase, you'll get a payment confirmation, making it easy to spot suspicious activity. If your Android device is ever lost or stolen, you can use the Android Device Manager to wipe your personal information. Though Apple Pay isn't an option for online shopping yet — right now it's only used for in-store purchases — rumors are that it's heading online this year. While we don't have the details, speculations are that you'll be able to make purchases in apps or through the Safari browser using your fingerprint as verification.